After two years of planning, fundraising and anticipation, the St. James’s Choir has returned from a very successful England trip. 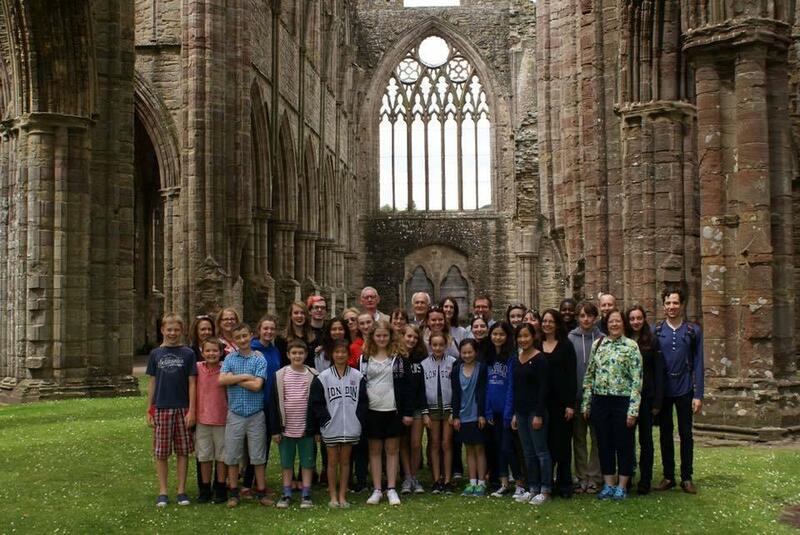 Leaving July 7 and returning on the 18th, over 43 travelers experienced a whirlwind tour of landmark destinations, singing daily Evensongs at Hereford Cathedral and Sunday services at Bristol Cathedral. 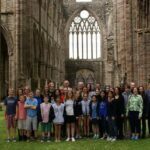 The trip began at St. James’s on Thursday, July 7, with families of choristers and travelers gathering in the cloister under pounding torrential rains. Just as it seemed that the whole group was about to soak our luggage and clothing in a sprint from the door to the charter bus, the rain subsided and the sun shined bright! We left West Hartford at 2PM and arrived at JFK just in time to be placed on an earlier Virgin Atlantic flight, hedging against the potential cancellation of our original flight due to mechanical difficulties. After settling into our overnight accommodations some 38,000 miles above the Atlantic Ocean, we enjoyed the great service and care of the Virgin Atlantic flight attendants. Our younger choristers were pleased to get free socks, toothbrushes and toothpaste, and the adults were equally happy to be served wine with our dinners. It took us all a while to pass through immigration control at Heathrow – we were a weary bunch and very ready to be away from any airport! But we eventually arrived at the Youth Hostel Association – St. Paul’s/Carter Lane, the lovely former choir school of St. Paul’s Cathedral. With a truly unbeatable location, it proved a worthy home for a long weekend in London; we were just steps from the Millennium Bridge which linked us to the many pedestrian pathways along the River Thames. It was also a very short walk to the Tate Modern, a monumental museum with great galleries and free admission to permanent exhibits. Many of us returned several times to enjoy the vast offerings, and the trebles were particularly interested in the Louise Bourgeois exhibit as well as the live music and dance performance in the main lobby. Other highlights included a tour of the Tower of London and the Crown Jewels. We were fascinated to see Henry VIII’s armor, various instruments of torture, and walk on the same floors as Anne Boleyn and other Royals who entered the tower for various very interesting reasons. While much of our time was spent in small groups roaming around the unique neighborhoods of Europe’s third largest city, we did come together to attend Evensongs at St. Paul’s Cathedral and Westminster Abbey. The Abbey Choir sang the Leighton Responses, Dyson in D, and Patrick Gowers’ Viri Galilaei, a stunning piece of music performed with nuance and perfect intonation. 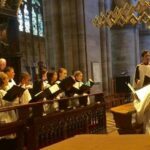 Though there were over 1000 people at Evensong, the room was completely silent as the congregation listened to the world-class Abbey choir. St. Paul’s Cathedral Choir also sang the Dyson’s Canticles in D and treated us to Mendelssohn’s Hör mein Bitten, sung in English, with a great boy soprano soloist. His voice was at the zenith of its beauty and power, and I couldn’t help but wonder how much longer it would be before his voice changed. Months, weeks, days? One never knows, but we were fortunate to hear him at this very special time in his life. After a truly wonderful weekend in London, we departed our hostel by coach for the journey to Hereford Cathedral. It ended up taking us much longer than expected to weave our way through central London and West to Herefordshire. Thus, we arrived too late for our scheduled tour of the Cathedral and had only enough time to vest and prepare for pre-Evensong rehearsal. Repertoire for our first Evensong included the Psalms of the day (59, 60, 61), Stanford in C, and the UK premiere of Philip Stopford’s My Servant Shall Be Healed. Joining us for the service were six lay clerks (the resident professional altos, tenors and basses of a cathedral), and Benjamin Straley, the organist for our trip. 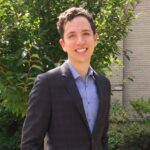 A dear friend of mine from Yale, Benjamin is currently Organist and Associate Director of Music at Washington National Cathedral. Tuesday’s adventures included visits to the hauntingly beautiful Tintern Abbey in Wales, and Goodrich Castle. The former is a 12th century Cistercian Abbey that fell into ruin during the Dissolution of the Monasteries in the 16th century. Everyone was surprised by how much they would enjoy the ruins. There is something particularly humbling and mysterious about the remains of Tintern, and many of us could have used more time to enjoy the various angles and vistas it afforded. Nearby Goodrich Castle was a different experience altogether. Though parts of the Castle were indeed ruined, many of the rooms remained in tact, and it was easy to see how a medieval castle might function back when they were still in operation. Some of our boy choristers particularly enjoyed visiting the landmark as they used their imagination to re-enact a foreign siege. Later that day we sang our second Evensong, with Canticles in D by Charles Wood, and the fabulous war horse, Bairstow’s Blessed City, Heavenly Salem. We returned to our accommodations at the Royal National College for the Blind and enjoyed another great meal by their catering staff. With individual rooms and bathrooms, it was a big step up from our hostel experience in London. Wednesday’s itinerary brought us to Blenheim Palace, a UNESCO World Heritage Site and the birthplace and country home of Winston Churchill. With a palace, grounds and gardens approaching the scale of Versailles, we couldn’t help but look on with mouths agape at the symmetrical grandeur of Blenheim. Equally stunning were the furnishings and artwork that decorated the grand hallways. One room in particular was furnished to host a lavish family dinner - but only on Christmas - there were other dining rooms for the other 364 days of the year. After we departed Blenheim, we spent the afternoon discovering the many natural and architectural treasures of Oxford University. 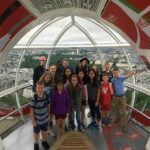 Branching off into small groups, some of us toured individual colleges, some visited the grand libraries, and others enjoyed a boat ride on the River Thames. We left Oxford around 7PM and many slept on the way home to Hereford. On Thursday we skipped our planned visit to Witley Court and opted for a rescheduled tour of Hereford Cathedral. If you have never been to the Cathedral, I would definitely recommend making it a stop some time in the future. Herefordshire is a farming region, so the area surrounding the Cathedral is quintessentially English, quiet and peaceful. And of course the Cathedral is a magnificent work of architecture with a world-class organ and acoustics. Evensong repertoire that day included Ayleward Responses, the Collegium Regale setting of Howells, and his hauntingly beautiful setting of Like As The Hart. The Magnificat was particularly good, and the trebles processed very well both in and out of the stalls! Friday’s adventure brought us to Gloucester Cathedral where we broke off into three guided tour groups. One of the guides focused on Harry Potter’s visit to Gloucester in 2001 when parts of the first film were shot at the Cathedral. The other groups focused more on the history and architecture of the Cathedral, including an unusual tour of the medieval Crypt. Among the relatively minor treasures held at Gloucester was a processional cross used at the Coronation of Elizabeth II. The only drawback of visiting the Cathedral that particular week was that the Nave was closed off in order to prepare for the annual Three Choirs Festival, a week of choral singing that rotates between Worcester Cathedral, Gloucester Cathedral, and Hereford Cathedral. When we returned to Hereford from Gloucester, many of us took some time to visit the Mappa mundi, the largest medieval map of the world still known to be in existence. Hereford Cathedral is home to both the map and the Chained Library, a medieval reference collection with rare vellum books like the 8th century Hereford Gospels. After taking in these historic treasures, it was time to sing our final Evensong at Hereford Cathedral. 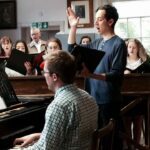 The choir sang particularly well for the occasion, and repertoire included Dyson in D and the Balfour Gardiner’s Evening Hymn. But the crowning achievement was the choir’s chanting of Psalm 78, the appointed psalm for Evening Prayer on the 15th day of each month. 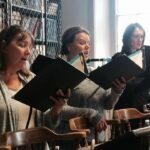 The choir sang all 73 verses to five different chant settings in 15 minutes and 45 seconds, beating the Cathedral Choir’s own record of 16’25. After the service, we gathered for pictures and an impromptu recording of My Servant Shall Be Healed. Then we crossed the green to enjoy a sherry reception with the Canon Precentor, Andrew Piper, inside his beautiful Georgian home within the Cathedral Close. We were in great spirits despite lamenting that our time at Hereford had come to an end. After a great week of singing, the choir took a break on Saturday to enjoy a leisurely visit to the quaint village of Ludlow. We began the day as a full group touring one of the first stone castles in England, Ludlow Castle. The history of this incredible place was dazzling, and it was fun to venture a guess as to which room hosted Catherine of Arragon and Prince Arthur during their honeymoon in 1500, or which room hosted Mary Tudor during her 19-month stay at Ludlow. The well preserved remains of a grand banquet room made it easy to imagine the countless medieval dinners and parties that once took place within the fortified walls. On our final full day, we traveled to Bristol Cathedral for Choral Eucharist at 10AM and Evensong at 3.30PM. The Eucharist was sung from a stage in the crossing due to the close timing of our visit with a graduation ceremony that was scheduled to take place later that week. The choir was quite exhausted from the early morning, but we rallied and sang a moving performance of American composer Stephen Paulus’s Pilgrims’ Hymn. Later in the day we finished our England tour with an Evensong featuring Wood in D, two hymns, and an encore offering of Pilgrims’ Hymn. A great sense of relief spread among us as we walked back to the choir room to disrobe, and I couldn’t have been prouder of the work we had done that week. A final dinner at Hereford Cathedral’s College Hall rounded out the tour and brought us back to a cathedral we were beginning to consider home. The Clergy and staff at Hereford were truly amazing in the way that they welcomed us and cheered us on each day at Evensong. As we arrived back at the RNC on the eve of our departure for Connecticut, many of us couldn’t help but feel nostalgia for a trip that was already over. 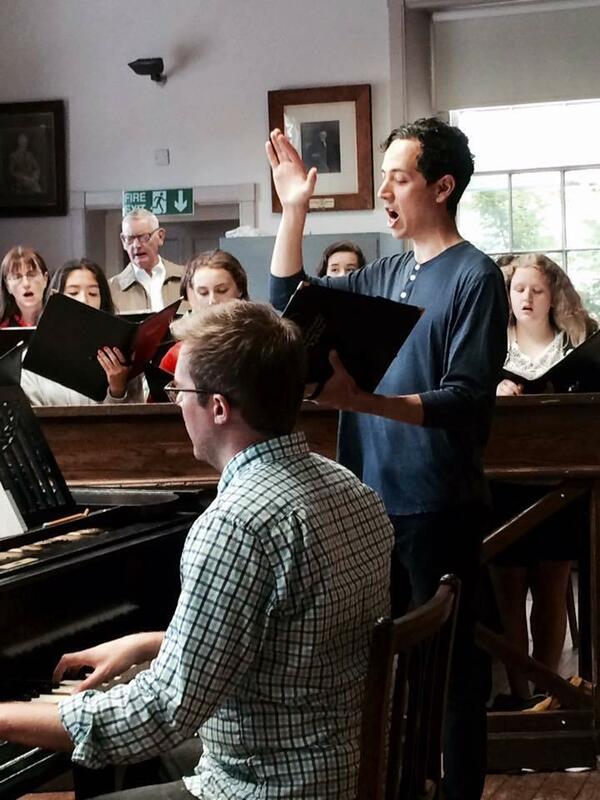 Choir tours to England become lifelong memories for every chorister. There is something about singing beautiful liturgical music in great sacred spaces that allows us to transport ourselves away from our daily concerns and trials. 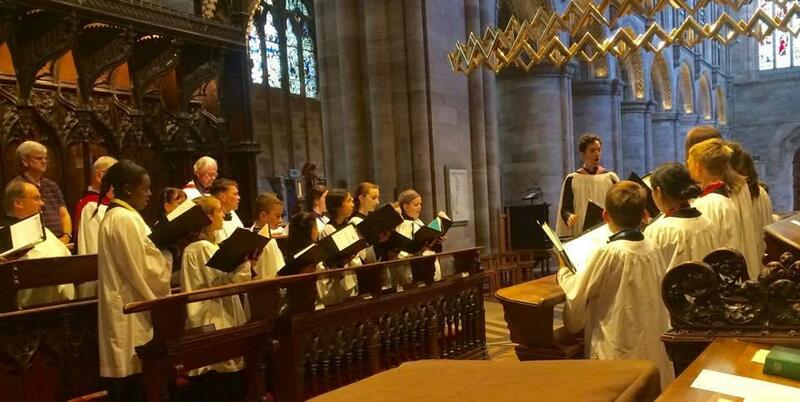 I will never forget my own choir trip to Hereford Cathedral when I was 10 years old. I know that this most recent journey will have a similar impact on our choristers as my first tour of Hereford has still had on me. Congratulations to all of our choristers and to the families who supported their musical pilgrimage to England. You make me and everyone here at St. James’s especially proud to call this parish home. Mr. Vaughn Mauren was named Organist and Choirmaster at St. James’s in 2014, having previously served as Director of Music for Young at Arts and Associate Organist at Christ Church, Bronxville; Organist of the Episcopal Church at Yale; and Organist and Choirmaster of Berkeley Divinity School at Yale. 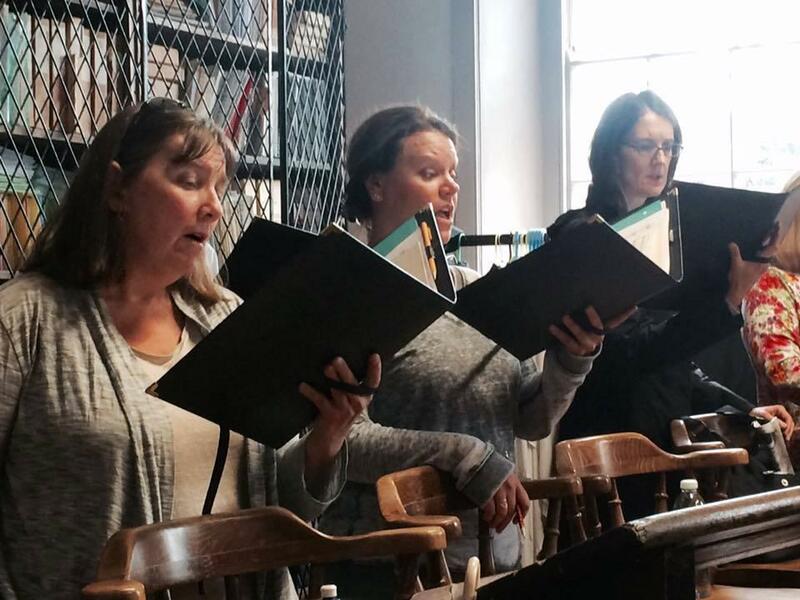 At St. James’s, Vaughn is passionate and deeply committed to the vocal and musical training of youth, and dedicated to finding new ways for our choir and music program to broaden its role in the greater community. Writers Reflect on Well-Known Hymns: Is Your Favorite On This List?